Do Roman Catholics believe in the mercy of God? Yes. We believe most firmly all that Scripture tells us about God's kindness towards man in his sorrows and afflictions and especially towards repentant sinners. With the Jews we pray to God as "merciful and gracious, patient and of much compassion, and true" (Ex. 34:6). We believe that God's mercy is immeasurably great (Ps. 50:3), all-embracing (Ps. 144:9); inexhaustible (Ps. 29:6); freely given (Ex. 33:19) and endless. One of the outstanding features of the life of Christ, who was God, was His mercy. Towards repentant sinners, mourners, the sick, the suffering and the needy He was unfailingly kind, sympathetic and compassionate. Yet do you not believe that this merciful God condemns sinners to an endless hell? That is not strictly speaking correct. What we do believe is that those who die in a state of mortal sin of which they have not repented are separated from God forever in hell. What do you mean by mortal sin? All sin is the breaking of the moral law. For a sin to be mortal certain conditions must be fulfilled. They are that the transgression must be (1) in a serious matter; (2) committed with the knowledge that what we do is seriously wrong and (3) with full deliberation and consent on the part of the will. If one or more of these three conditions is missing there is no mortal sin. You cannot commit mortal sin by accident; therefore, you cannot go to hell by accident. Does God give every man enough help to save his soul? Yes. "God our Saviour . . . . will have all men to be saved" (1 Tim. 2:4). "The Lord . . . . dealeth patiently for your sake, not willing that any should perish, but that all should return to penance" (2 Pet. 3:9). He does not entirely withdraw his grace even from blinded and hardened sinners. The Bible is full of admonitions to sinners to repent; these presuppose that repentance is always possible with the help of God's grace: "I desire not the death of the wicked, but that the wicked turn from his way and live" (Ezech. 33:11). What does "hell" mean? The place and state in which the devils and such human beings as die in enmity with God suffer torment for ever. Is hell a place? Yes; that has always been taken for granted by the Church though it has never been defined as of faith. It is the most natural inference from the texts of Scripture. Where is hell? We do not know; God has never revealed that to us. Is a Catholic bound to believe in hell? Yes. The Athanasian Creed (5th or 6th century) professes that "it is necessary for salvation to believe that those who have done evil will go into everlasting fire. This is the Catholic faith. Everyone must believe it, firmly and steadfastly; otherwise, he cannot be saved." The fourth Lateran Council, 1215, states : "Christ will reward all according to their works . . . . the wicked will receive a perpetual punishment with the devil." Pope Innocent IV stated in 1254: "If anyone dies unrepentant in the state of mortal sin he will undoubtedly be tormented for ever in the fires of an everlasting hell." From the second Council of Lyons in 1274 we have : "The souls of those who die in mortal sin go down to hell." Pope Benedict XII declared in 1336: "According to God's general ordinance, the souls of those who die in personal grievous sin descend immediately into hell, where they will be tormented by the pains of hell." Earlier Pope Innocent III had written to the Archbishop of Arles in 1301: "The punishment for original sin is the loss of the vision of God; but the punishment for actual sin is the torment of an everlasting hell." Did Jesus Christ say we must believe in hell? Yes, clearly and many times : "Depart from me, you cursed, into everlasting fire, which was prepared for the devil and his angels" (Matt. 25:41). "Depart from me all ye workers of iniquity. There shall be weeping and gnashing of teeth, when you shall see Abraham and Isaac and Jacob and all the prophets, in the Kingdom of God; and you yourselves thrust out" (Luke 13:27-28). "It is better for thee to go into life maimed or lame than, having two hands or two feet, to be cast into everlasting fire" (Matt. 18:8). "Fear him that can destroy both soul and body in hell" (Matt. 10:28). Many other texts could be quoted. Is it not strange that St Paul never mentions hell? He does. He says the fate of the unredeemed is to be "death" (Rom. 6:21-23). The encounter with God's wrath will bring "tribulation and anguish" (Rom 2:5,9). "Who shall suffer eternal punishment in destruction" (2 Thess. 1:9). "The unjust shall not possess the Kingdom of God" (1 Cor. 6:9; Gal. 5:19-21). Will hell last for ever? Yes; read again the texts already quoted. Jesus Christ says also: "The worm dieth not, and the fire is not extinguished" (Mark 9:47). St Jude refers to: "Those to whom the storm of darkness is reserved for ever" (Jude 13). St John says: "The smoke of their torments shall ascend up for ever and ever" (Apoc. 14:11). May not the word translated as "eternal", "everlasting" and "for ever" have other meanings, for example, "age long"? Yes, but Jesus Christ contrasts eternal punishment with eternal life. Nobody doubts that heaven is going to be eternal; why then doubt it about hell? Christ says the fire will never be extinguished; the worm will never die. He said it would have been better if Judas had not been born. Nothing He said suggests that we should qualify His references to eternal fire. Did not St Peter say (Acts 3:21) that all things would be restored? Yes; but before the Judgment and not after it. He was referring to what would happen on earth, not to hell. Does not the word translated as "hell" mean simply the grave? Sometimes yes, but not in the texts we have quoted to prove the existence of hell. Does not St John's Gospel contradict the others about hell? No. St John always pictured men's future destiny in terms of eternal life or eternal loss (John 3:3,15; 6 : 40,55,59; 12:25,48,50; and 20:31). Did not early Christian writers believe that hell would end? Yes, a few did following Origen (185-255). But Origen was condemned at a Synod of Constantinople in 553. Apart from these few the Fathers unanimously believed that the eternity of hell is clearly taught in the New Testament. What are the pains of hell like? They are two-fold, the pain of loss and the pain of sense. What is the pain of loss? It means being deprived of the direct vision of God. It is the most bitter torment of hell. Is not the pain of loss a merely negative thing; what one has not enjoyed one will not miss? That is not so. The pain of loss is very positive. Anguish is caused by the frustration and emptiness of souls that were created to enjoy the direct vision of God, by their knowing that the God on whom they depend is an enemy for ever, by their remorse at having themselves forfeited the greatest blessings, by their inability to satisfy nature's innate craving for happiness, by their consciousness that God is infinitely happy and that they are powerless against Him. What is the pain of sense? It includes all the other torments of hell except the pain of loss. 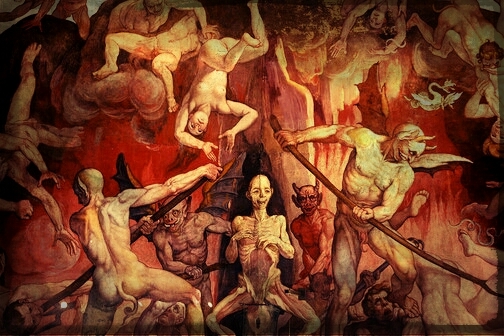 Until the final resurrection only souls are in hell; but souls have no senses; so how can they suffer the pain of sense? The term "pain of sense" does not mean merely punishment inflicted on the bodily senses; it is certain that the souls in hell suffer from real, created, physical fire.